I walked into Blockbuster video the other day to return some films, and I passed by a table of �previously viewed� video tapes. One in particular caught my eye: The Secret Life of Girls. I recognized the title, and immediately purchased it. What does this have to do with Jackie DeShannon, you may ask. Well, back in issue #1, I mentioned that Jackie had recorded a new song, called Keeper of the Dream. It could be found on an unreleased soundtrack to a film titled Unglued. 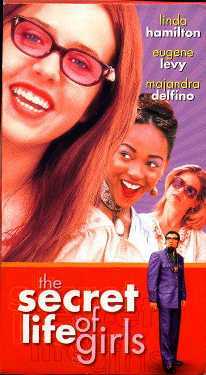 The name of the movie was later changed to The Secret Life of Girls, and was shown at some film festivals, but apparently never found a theatrical distributor. So I was very excited when I happened upon it in the video store. The price? Only $4.99. I was mostly curious to find out how Jackie's new song would be featured in the film. In so many movies these days, the songs are often hidden in the background, and maybe only a few seconds of the song will be heard. This was not the case here. Keeper of the Dream is featured prominently, and in its entirety, over the opening credits and the first scene. There is even an instrumental version of the song included. In addition, Jackie gets a prominent mention during the opening credits: Keeper of the Dream performed and written by Jackie DeShannon. It is unfortunate for Jackie that the film wasn't released in theaters. If it was, not only would her new song be heard by many more people, but it could also have been eligible for an Oscar nomination. Wouldn�t it have been great to see Jackie singing her nominated song live on the Academy Awards broadcast? The film itself is a well-meaning but flawed coming of age story about a fifteen-year-old girl dealing with the divorce of her parents in the 1970s. There are many sweet and funny moments, although overall I�d say the film is enjoyable, but average. At this point though, it is the only way to hear Jackie�s new song, so by all means, look for this one.